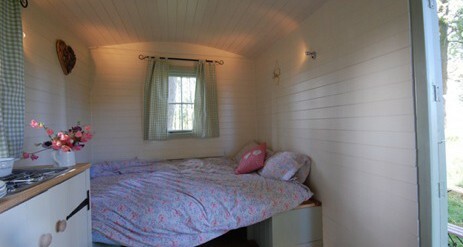 Glamping in Sussex in beautiful hand built Shepherds huts sited in a sunny glade in the woods or camp in small secluded woodland on our 200 acre family farm. Wander through the orchards to the National Trust’s Bodiam castle and the local pub, take a ferry ride down the river, hop on a steam train, or just relax in front of the camp fire and enjoy the beautiful countryside. 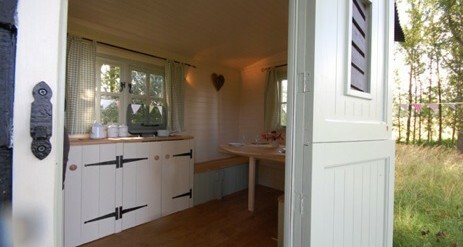 The Huts are hand built by Nick here on the farm in the tiny village of Bodiam in East Sussex, our huts are based on the idea of an old Shepherd’s hut. 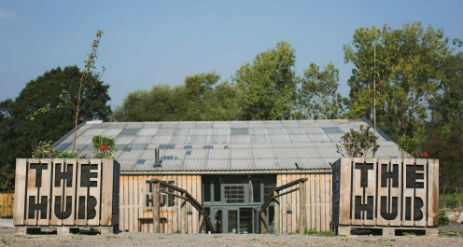 What makes them unique in today’s market is that (in true agricultural fashion) they are built using reclaimed, recycled and locally sourced materials wherever possible. The aim of this is to make them of the lowest possible environmental impact. 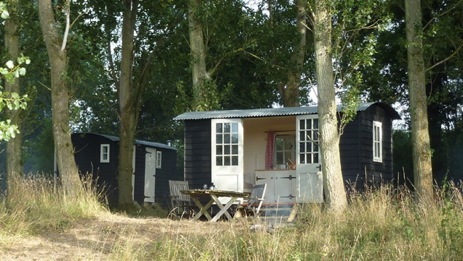 Currently there are two Hut sites on the farm, each site is home to five Huts, two of which offer living accommodation for up to 4 people, two further living huts are 5 berth. The 5th hut is the wash hut. The huts are fully equipped and a linen service is provided. Each hut has outside dining furniture and its own fire pit for cooking (logs and cooking equipment provided). A gas hob is fitted for convenience, as well as a sink with cold running water. Hampers of fine local produce can be arranged for your arrival. These are bespoke and need discussing fairly well in advance. The hut is quickly and easily changed between its day and night functions. The day bed at one end easily converts to become bunk beds, and the dining table at the other end folds down to make a double bed. 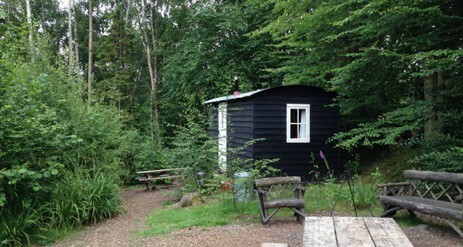 To keep the environmental impact of the accommodation to a minimum the huts are not connected to a mains electric supply. Electric lighting is provided by means of a solar panel on the roof offering an easy and safe means of lighting. The wash hut provides washing facilities. It houses two loos with basins and two showers. Each have both a hot and a cold water supply. 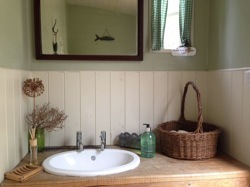 There is also loo roll and hand soap in the wash hut. A torch, towels, marshmallows, a lighter, car phone charger and some wellies! Bring your own tent, or alternatively we have 5 of our beautiful bell tents available for hire, that will be all set up and waiting for you on your arrival in one of our picturesque campsites. Our campsites offer wash huts with 2 loos and 2 piping hot showers, private fire pit per pitch and a covered seating area in case of any changes in the Great British weather! Providing a friendly service and amazing products and experiences in a fun, sustainable environment is incredibly important to us. 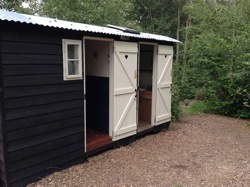 We have followed in the footsteps of The Original Hut Company when creating The Hub. Our shop is stocked full of local goods and all of your camping essentials! 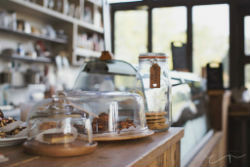 We’ve worked to bring together local businesses so that The Hub has something for everyone. From gentle country walks to foraging for your supper to the more adrenaline filled activities, we’re set up for all types. Everyone involved has been hand selected due to their love and passion of what they do. We want you to go home with a smile on your face and we’re sure that our group of lovely instructors will help this happen. There is a camping fee of £22 per pitch per night + £3.30pppn for adults and £2.20pppn for children + the Bell tent hire charge of £55 per night. 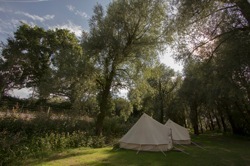 We can arrange an exclusive site for the tents. 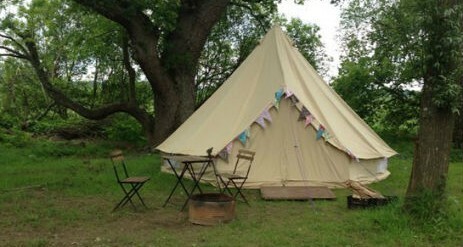 For this service we remove the camping charge from the invoice and charge £375 per night for the site.